Stovetop stainless steel kettles... efficient and easy to use. A more traditional way to heat water. Many great styles! These VERY LARGE 18/10 stainless steel stovetop kettles have tri-ply heat conducting bottoms and will work on all cooktops including induction cooktops. Moveable handle makes filling easy. Made in China. Large kettle: 6 QT (192 oz). 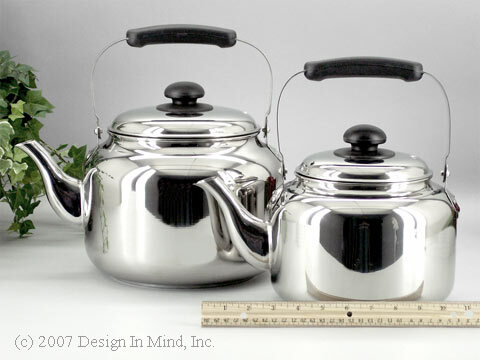 Large kettle will fill 8 standard 4 cup (6 oz cup) teapots. Overall size 12"w x 12"h. Base that comes in contact with stove is 7" dia. Small kettle: 3.75 QT (120 oz). 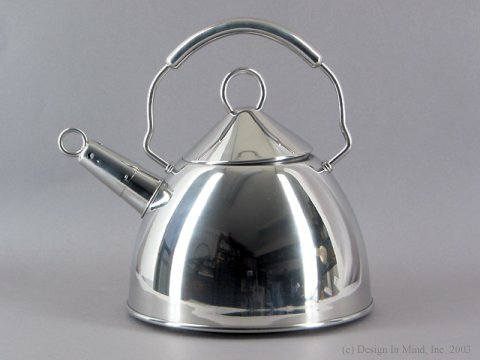 Small kettle will fill 5 standard 4 cup (6 oz cup) teapots. Overall size 11"w x 11"h. Base that comes in contact with stove is 6" dia. GREAT for heating enough water for a tea party!! 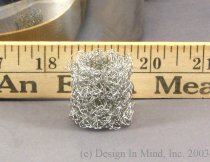 Heavy 18/10 stainless steel throughout. Aluminum sandwiched bottom for fast heating.